Kemp also unveiled the cover of the 2019 Explore Georgia Travel Guide.The 190-plus page travel guide provides visitors with detailed information on Georgia’s tourism assets, including trip ideas, attractions, accommodations and events. More than 700,000 copies are printed to inspire potential visitors to book trips filled with authentic Georgia experiences. The guides are available for free at one of the state’s 11 visitor information centers, travel and trade shows, ExploreGeorgia.organd 1-800-VISIT GA. To pick up a copy of this travel guide, you may stop by our welcome center located at 696 First Ave, East Ellijay. 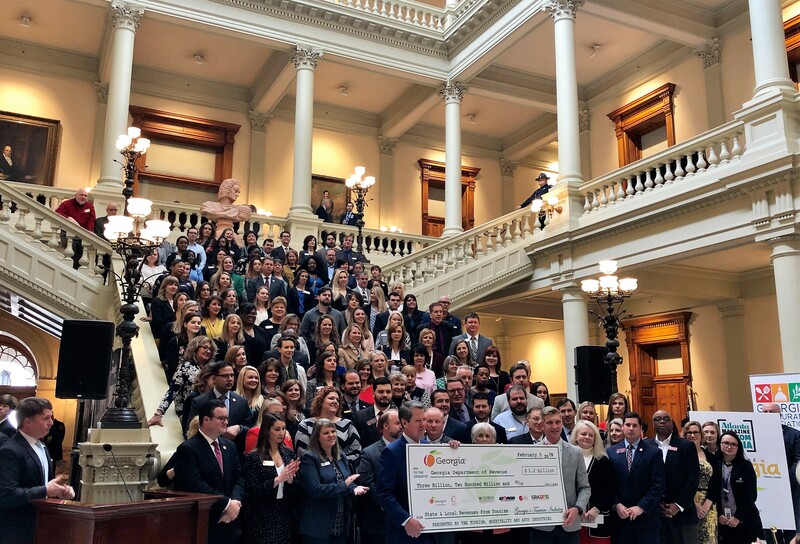 GDEcD partnered with Atlanta Magazine Custom Media, the award-winning publisher of Atlanta Magazine and Southbound Magazine, to produce the travel guide. While the chamber staff visited the Capitol, they delivered delicious local apple products to Speaker of the House David Ralston, Senator Steve Gooch and other area representatives and thanked them for their support of our local tourism industry. Gilmer County is fortunate to have leadership that recognizes the economic impact that tourism has on our community and continues to support our efforts.